I am tired of french fries. I never thought I’d hear myself say that, but it’s true, and it’s because of baseball. Soccer you aren’t even given bleachers, let alone a place to buy a snack. You endured the game with whatever you felt like packing, if anything at all. Now that the kids are older and play organized baseball and softball, it seems that every town we play in, including our own, has the much beloved snack shack. What used to be an occasional treat has now become a nightly offering that I have to fend off. Fries, soft pretzels, slushies, soda and Big League Chew are being requested left and right, and there isn’t much I can do but give in to the madness. I have done everything I can think of to fend off the greasy magnetism of that shack but I keep losing. I pack fruit, nuts, Goldfish but fries seem to make it into the mix anyway. I have fed the kids dinner at 4pm, but by the start of the game at six, the one that isn’t playing is asking for skittles or fries. Then after the game is over, the one who played thinks they deserve an ice cream or yet again – fries. And to top it off, there is nothing worse than stealing one of your kid’s fries and it turns out to be a lukewarm, soggy mess. I mean, if you are going to indulge, it better be worth it, right? So in honor of the potato, I felt like doing it justice this past weekend. 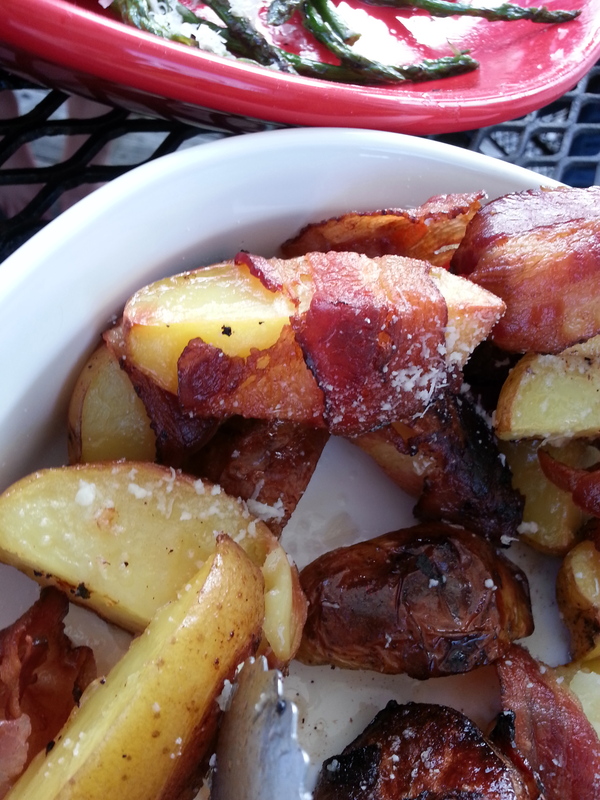 We had family and friends over and were grilling steaks, and although I have a “go to” recipe for crispy oven-roasted potatoes, I saw this one and knew that the bacon would be a hit with everyone. So I put my girlfriend to work wrapping them up, and by the looks of the empty bowl at the end of dinner, I’d say that I became a potato fan again – we all did. Preheat oven to 425. Coat a jelly roll pan with non-stick cooking spray. Sprinkle potato wedges with kosher salt. 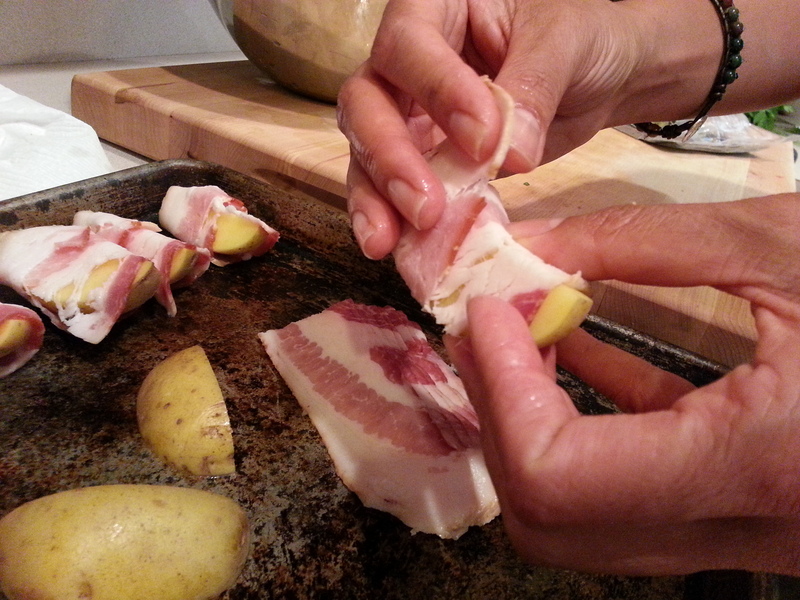 Wrap each potato wedge with the halved slice of bacon. 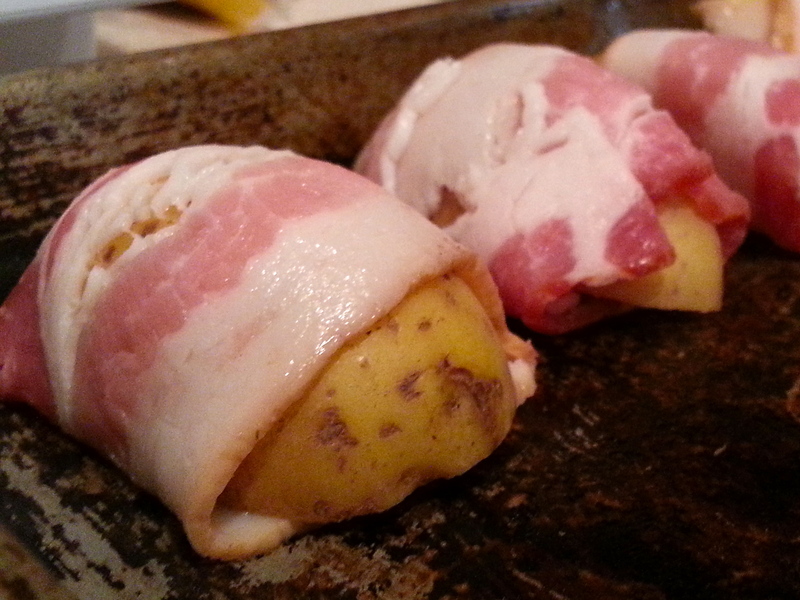 Arrange potato wedges in a single layer on the cooking sheet. 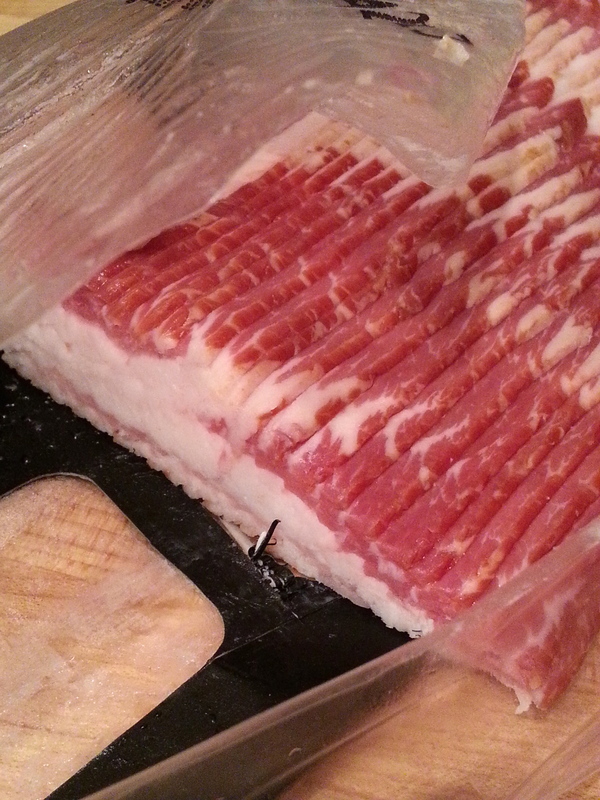 Bake at 425 for 40 – 45 minutes or until bacon is crisp and browned. note: this serves 6-8 people. This entry was posted in appetizers, pork, sides, veggie and tagged appetizer, bacon, oven roasted potatoes, pork, potato, potatoes, side dish, wedges, wrapped. Bookmark the permalink.